2017, the year of living greener, hacking and sharing skills! It looks like the trend for greener living is one that's not going away anytime soon nor is the philosophy of sharing knowledge and finding eco friendly solutions to improve life in general! Looking through this book at a first glance you'd think it was a straight forward gardener's encyclopedia but it's far from that! What we do find is a book with a different way of doing things -actually you'll find it has 101!- of improving your green spaces through using simple everyday gardening skills to rejuvenating your garden with amazing recycling based projects or hacks. 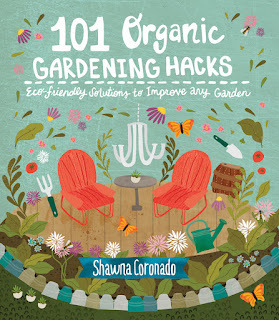 This new title by Cool Springs Press, 101 Organic Gardening Hacks by Shawna Coronado is all about sharing her tips, tricks and showing you how to find practical solutions for the home garden. From practical time savers, clever up-cycling projects using everyday items to help you achieve an environmentally friendly, organic green space. Divided into categories for easy reference the 101 hacks are accompanied by clear photographs and easy to follow instructions. Having just recently moved into a house with a garden I found the prospect of using this book in my own little space extremely exciting! I can't wait to get my hands dirty come Spring time! And also because I'm usually on a tight budget recycling and using found objects is something I also find really attractive and interesting. I know I'll finally get the perfect garden with the help of this title by reproducing quite a few projects as well as put into practise some of the planting and growing advice. We've inherited someone else's gardening choices and as much as I do love the Japanese style of our tiny garden I also feel that due to years of neglect that it could do with some attention and a good old re jig! It's also super shady so any vegetable growing has been limited. Last year's tomato crop yielded 4 tiny little berries... though the quince tree is thriving and happy -we got 8 kilos of plump fruit in early Autumn- so it's never going to be a bountiful vegetable field! Coming to the conclusion that it won't be like Tom and Barbara's small holding in The Good Life was tough to accept! My planting will have to work around its natural geographical placement so it will be more of an ornamental garden with a few choice veg... And that's OK! I will however have lots of nifty tricks to make my space an insect friendly, chemical free paradise using what I've learned... from weeding the environmentally friendly way (OH yes it can be done!) to harvesting seeds! 101 Organic gardening Hacks is for those who love experimenting and creating a space which not only looks great but also gives untold amounts of joy and by following an eco-friendly regime you'll be giving back to mother nature too! 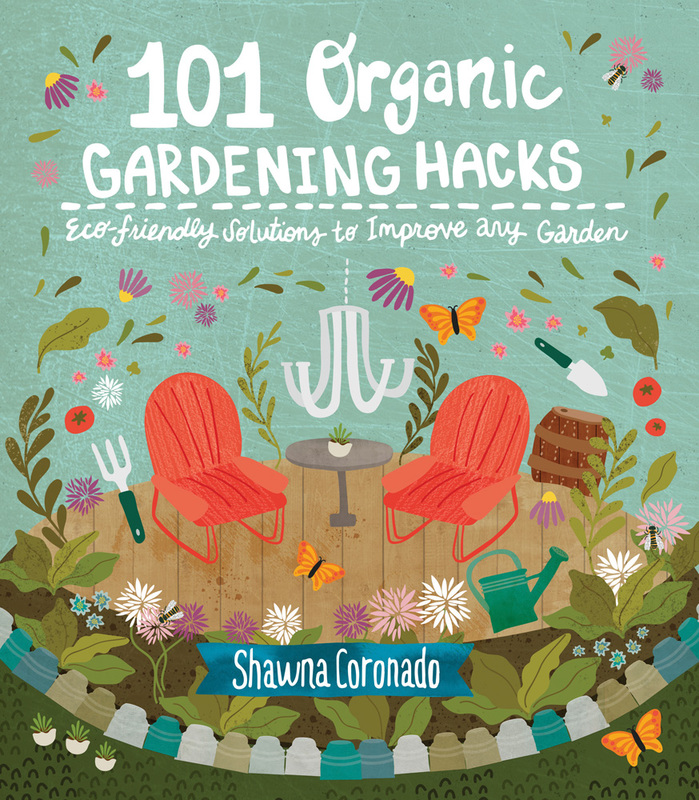 Thanks to Shawna Coronado and her quirky and creative ideas and her absolute love of gardening, this book will undoubtedly help both novices and the seasoned gardeners who are after a bit of inspiration. There are lots of projects from simple decorating techniques to useful hacks like creating your very own irrigation system with a drip line kit! I particularly love the outdoor chandelier and the pallet furniture but also the useful tips like how to keep your garden pest free with zero pesticides! There is so much to take away from this book so if you're looking to become the new Monty Don or just after a animal friendly, eco friendly garden then I'd totally recommend this new title. Though I won't be creating the gardens of Babylon I have faith that my little patch of urban greenery will become my very own private garden of Eden! Minus the snakes... no, really, no snakes even though I love them but hedgehogs, birds and insects will be most welcome! To order 101 Organic Gardening Hacks at the discounted price of £9.99 including p&p* (RRP: £12.99), telephone 01903 828503 or email mailorders@lbsltd.co.uk and quote the offer code QPG466. *UK ONLY - Please add £2.50 if ordering from overseas.